Share this image on Instagram using the hash tag shown above! One share per person, per day! Hi Everyone!! I miss you all!! Things have just been so busy!! I was out of town with friends camping over the weekend and had a much needed break! I'm hoping to have a post ready for Tuesday, but until then, how about a fun giveaway feature some beautiful blue polishes from Delush Polish? April is Autism Awareness month and blue is a color that represents it! A huge thank you to Adrianna for donating her lovely polishes for this giveaway!! Autism is a disorder of neural development characterized by impaired social interaction and communication, and by restricted and repetitive behavior (credit - http://en.wikipedia.org/wiki/Autism). For more on Autism and how you can spread the awareness, head to http://www.autismspeaks.org/what-autism/world-autism-awareness-day. 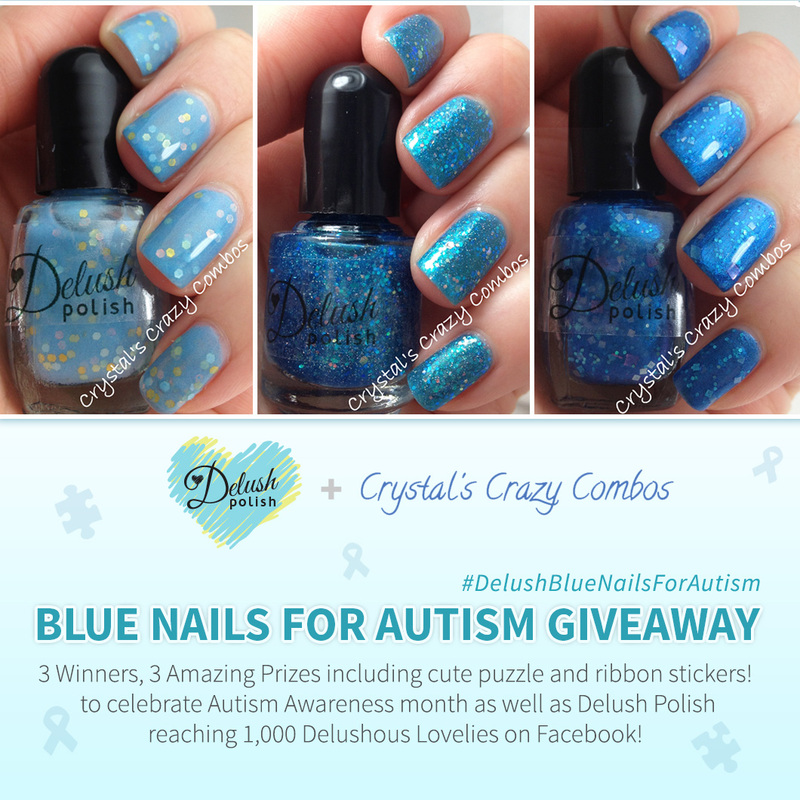 There will be 3 winners, each receiving one of the three beautiful Delush Polishes and a set of puzzle piece nail decals and ribbon nail pieces in blue colors! You can shop for Delush Polish HERE on Etsy. Included for you, dear readers, is a promotional code for 15% off your order (no minimum required) that expires June 1, 2013! Use code: "DP15OFFCRYSTAL" on your order! To stay up to date on Delush Polish, you can head to Facebook, Twiter - @DelushPolish, and Instagram - @DelushPolish. Included with each order is a "scratch your heart out" card!!! Adrianna describes it as: "Each order comes with the opportunity to scratch your heart out by revealing if you are one of the lucky few that have the opportunity to get anywhere from 10% to 50% off, buy one get one free, or free shipping on your next order. You may even get the chance to name the next collection or polish!" So awesome, isn't that? I used 3 coats along with Clearly on Top by KBShimmer. This is Free Mr. Bates! I used 2 coats along with KBShimmer Clearly on Top. Best of luck to everyone!! This ends 12am Central Time on May 9!!! Following Blog, Instagram, Twitter, and Facebook will allow only one point each, per person. You may tweet, share the image above (Instagram), and share on Facebook as many times as you would like, with one point given per day, per person. This giveaway is open internationally! Thank you for the support and remember to spread the word about Autism! Hey Winda! This is also open internationally :D Good luck!